В викторианском и арт-деко стилях. 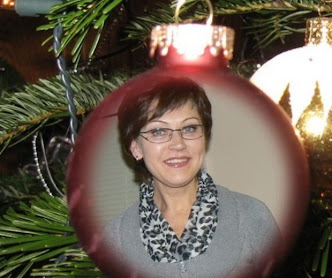 Нашла сайт - там это все продается в большом количестве. Они, конечно, сильно на любителя, я их показываю, как пример рукоделия и вкусов той эпохи. Но некоторые есть очень даже красивые. 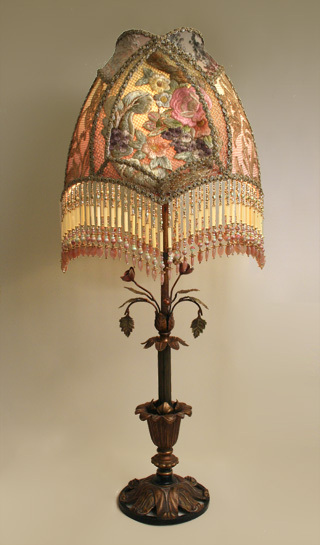 Lovely floral motif floor lamp with beautiful amber drops holds this red Camelot shade with richly embroidered poppy appliqués. 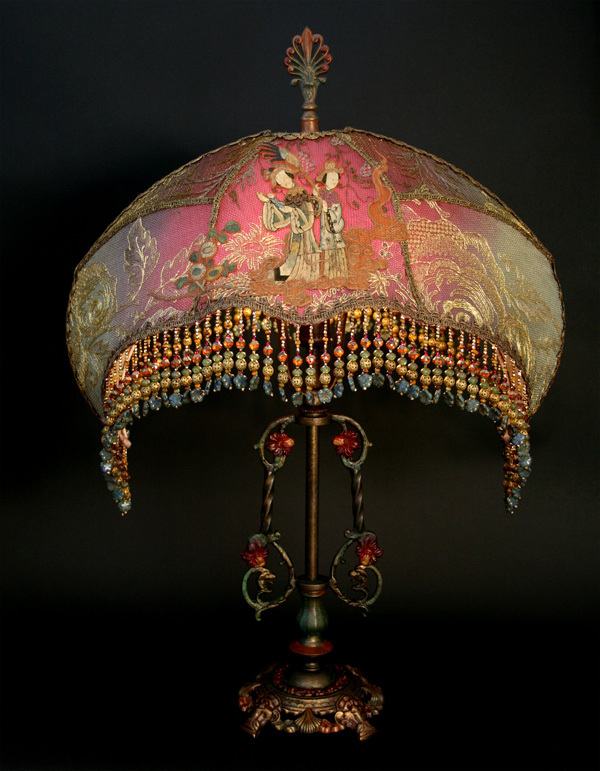 Shade is covered in antique silk velvet, vintage metallic gold net and 1920s era lame. 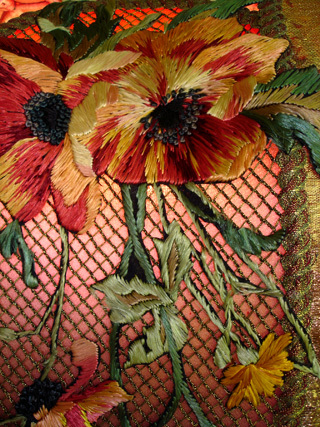 Poppy appliqués are from an antique shawl. 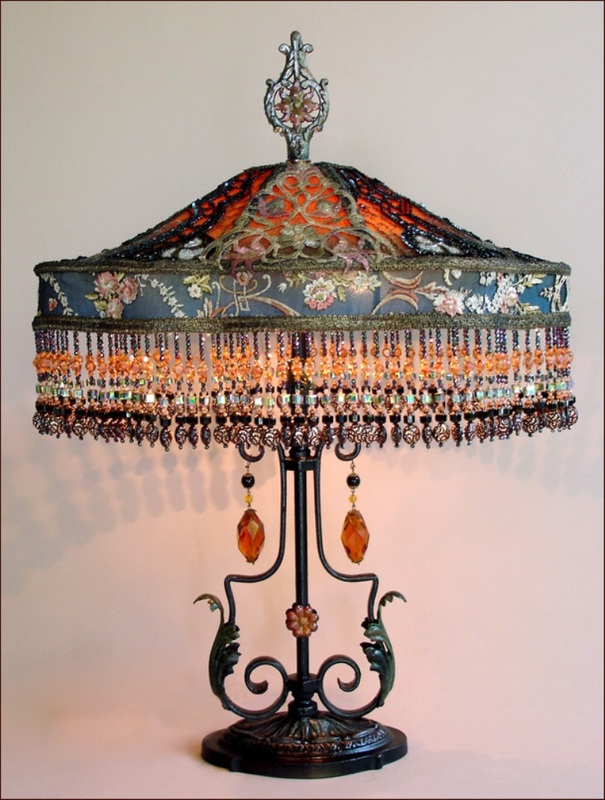 Regal hand beaded fringe has heavy, real Carnelian gemstones as end drops. 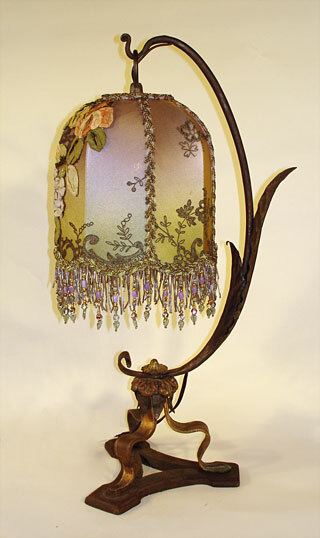 Hanging lantern base holds this "Victorian Bell Jar" shade. 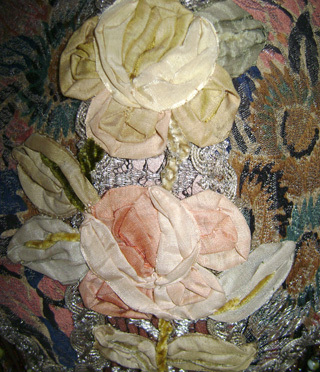 Shade is hand dyed dusty lavender to mossy green and is covered with the most incredible victorian era ribbon flowers taken off an old pelmet. Dark bronze metallic net overlay lace. 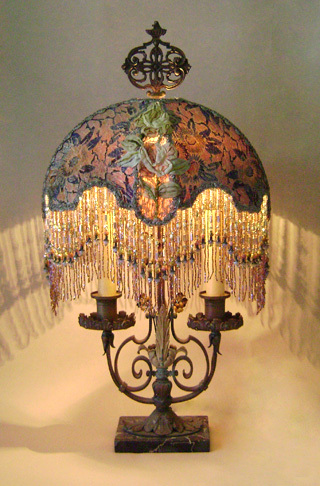 Antique gold bullion fringe is interspersed with hand beaded fringe. 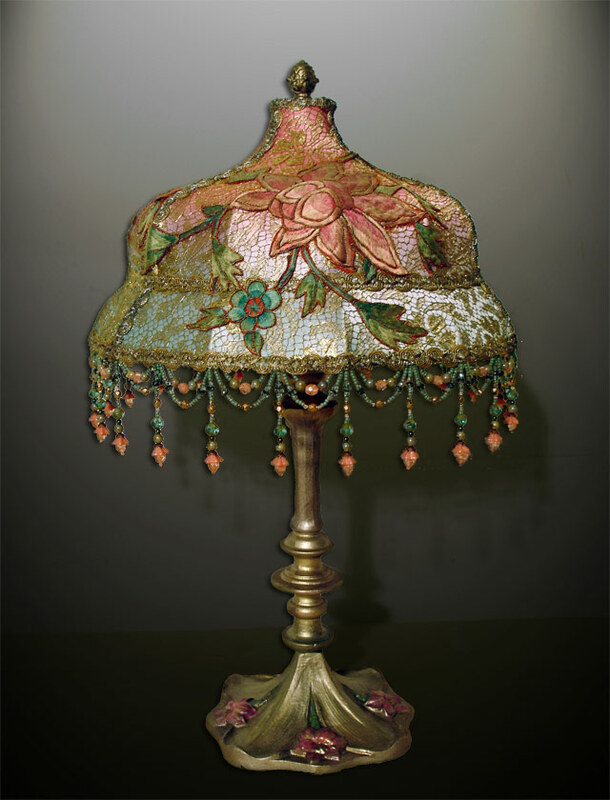 Beautiful and unusual antique marble and tole table lamp with great 3-d flowers in the base. The Half Moon shade covered in 1920s printed lame with an almost watercolor effect. Colored metallic net are in the side panels. 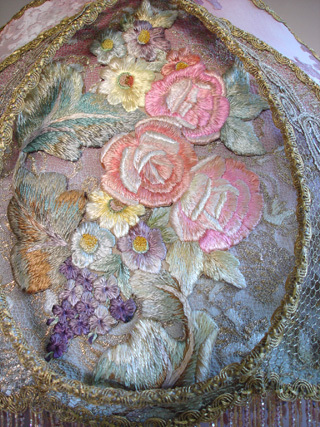 Front panels have overlays of exceptional large antique ribbon flowers from France. 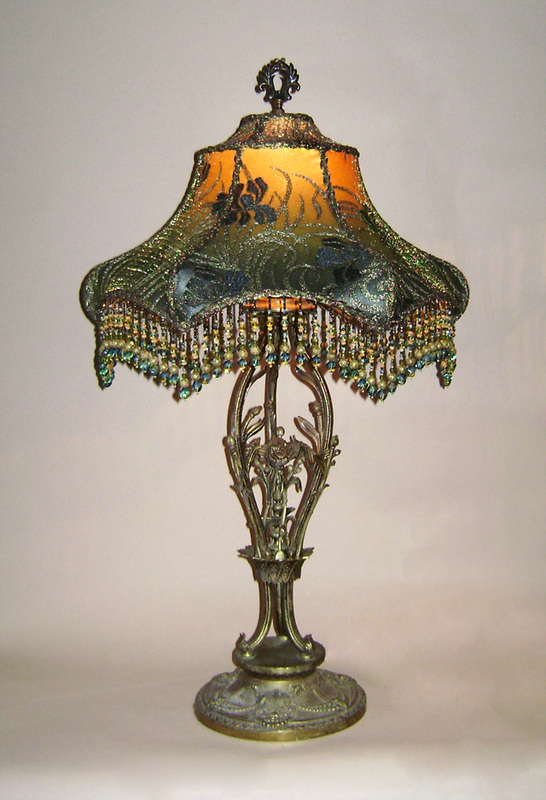 The Chinese River shade in plum and jade green sits atop an ornate hand-painted 1920s cast metal lamp base. 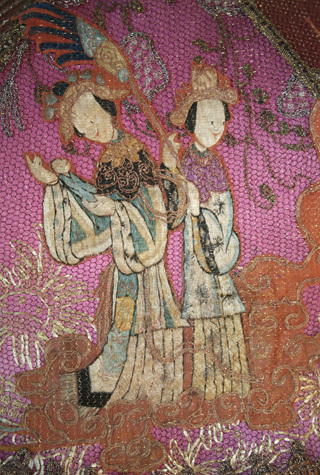 The shade is covered in gossamer antique metallic and net fabrics and rare, pristine Chinese embroidered figural appliqués. 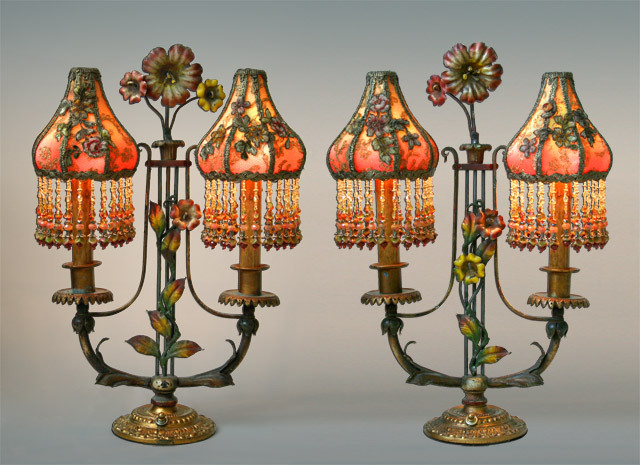 Exceptional pair of French flowered, antique tole candelabra lamp bases with original paint. 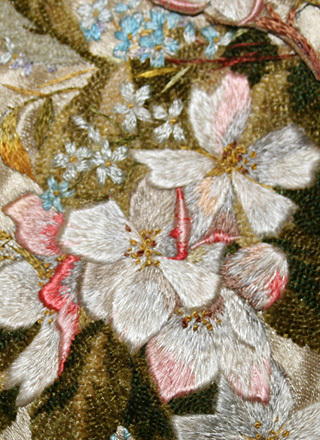 There is one flower missing on one base and a leaf on another but it is hard to notice and does not detract much - if at all. 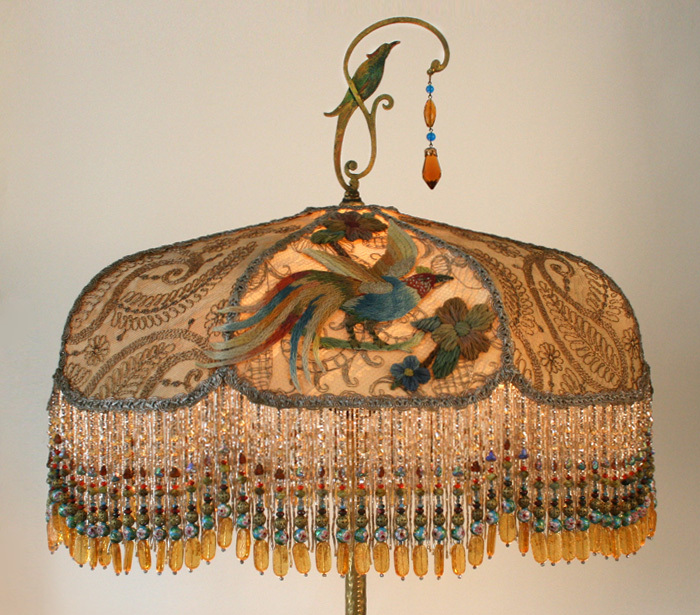 Dramatic, exotic 1920s lamp base with bird motif holds a Victorian Bird shade. 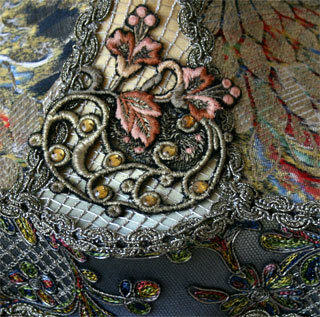 Shade is gold and covered in antique paisley net lace, silver metallic lace and colorful antique wool bird and flower appliqués. 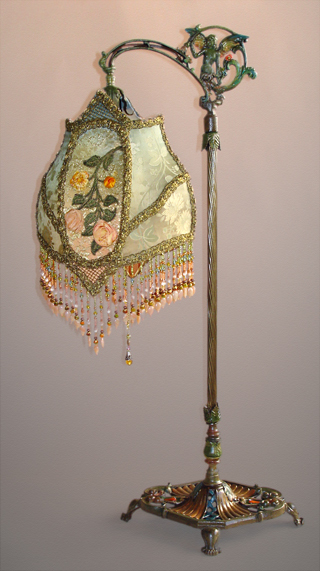 Hand beaded fringe and beaded tassel pull chain embellish the lamp. 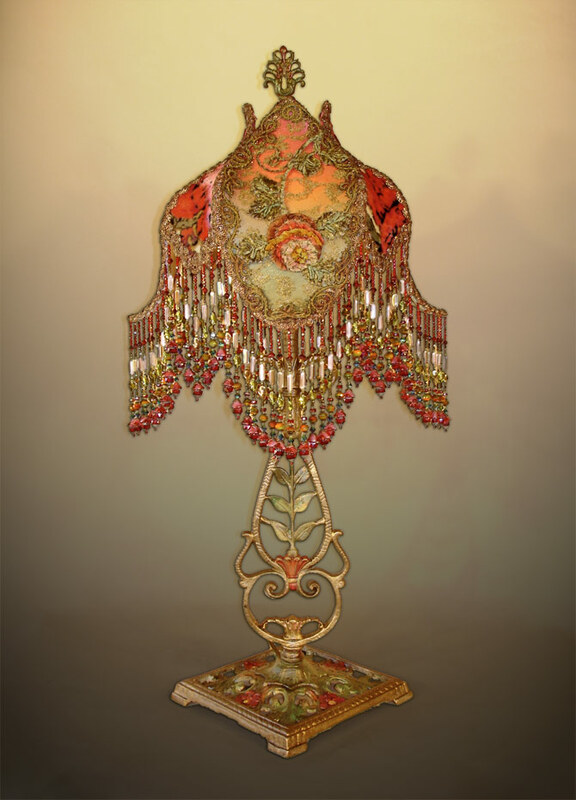 Rare and fabulous Victorian bird finial with antique Czech glass gem dangles. 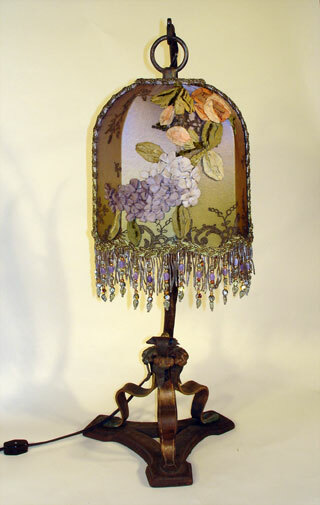 Antique 1920s lamp base holds a stately and elegant Iris Garden shade in soft tones of pewter, lavender and pale sage green. 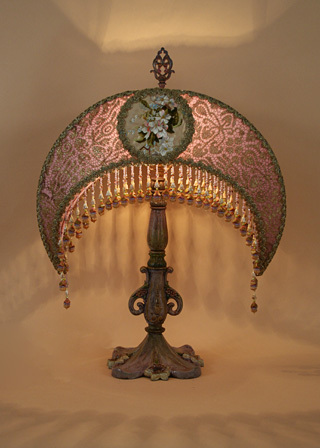 Covered in antique lame, silver metallic lace and beaded net, exceptional hand embroidered iris appliqués circa 1880 adorn the front of the shade. 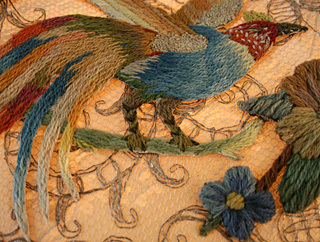 Long hand beaded fringe in matching tones. 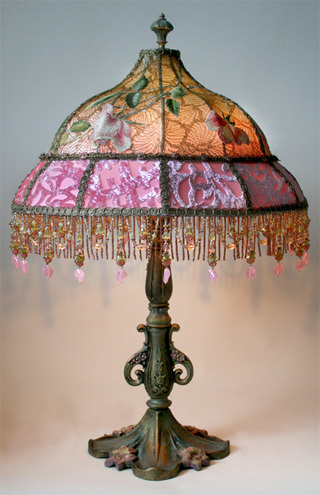 Ornate 1920s tole bridge lamp with dimensional flowers holds a Spring Garden shadowbox shade in soft, romantic pastel tones of pink, green, butter yellow, peach and lavender. 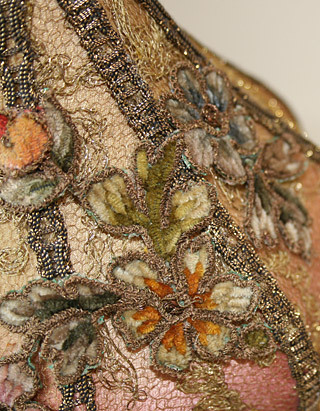 Antique hand-dyed cut velvet and gold metallic lace overlay the panels and the shadowbox is filled with rare, heavy, luxurious French floral embroidery and Victorian era gossamer gold mesh. 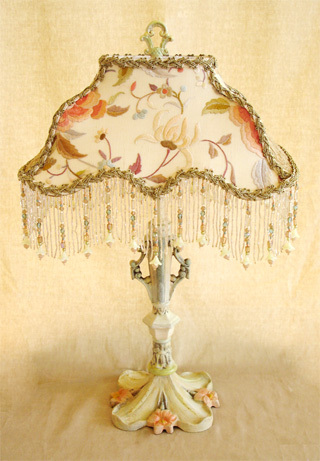 Ornate hand painted antique table lamp with lovely floral motif styling. 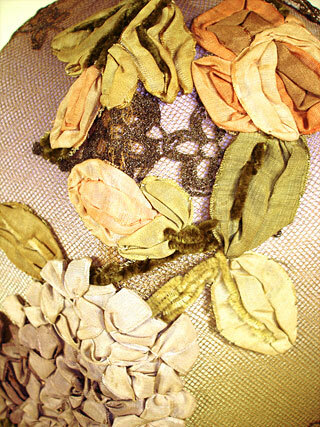 Capstone shade is covered in Victorian silk cut velvet, metallic lace and incredible French handmade ribbon roses off of a couture textile purchased in Paris. 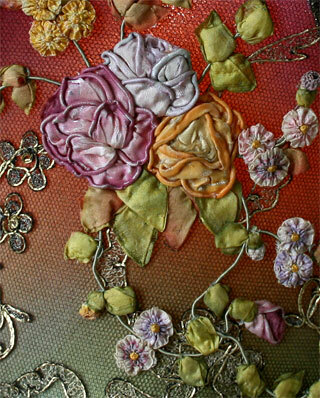 The colors of the shade are moss green, apricot and mauve-rose pink. Long heavy hand beaded fringe. 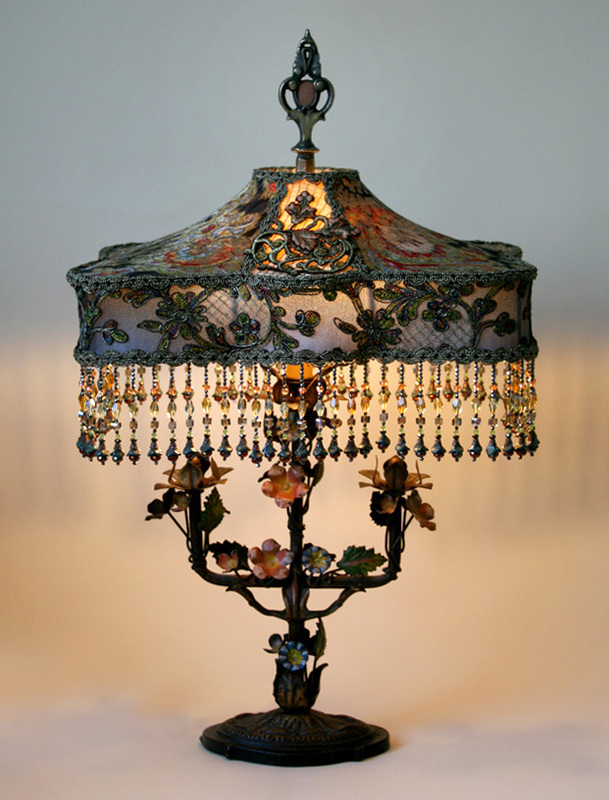 Vintage finial with antique crystal tops the lamp. 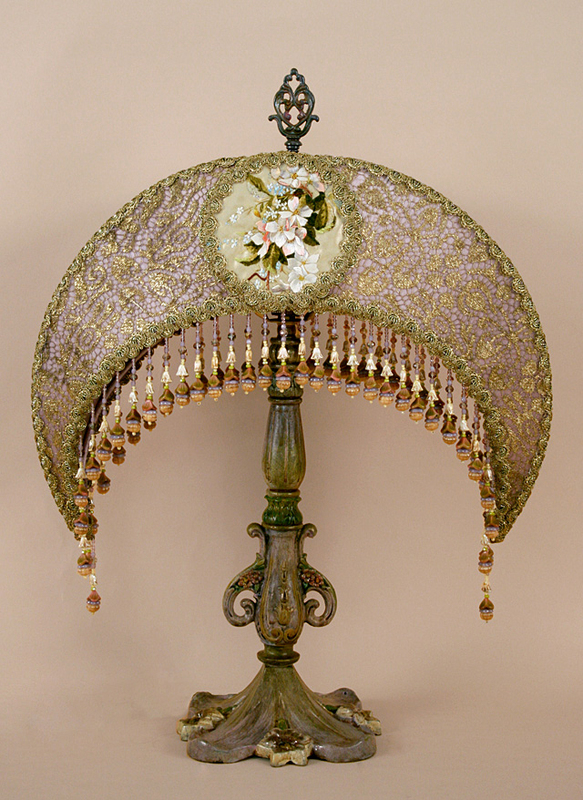 Wonderful Victorian metal lamp base adorned with a dramatic Crescent lampshade with high-quality antique Spanish embroidery with Lilies (that match the Lily motif in the base) in the center circles and 1920s era gold metallic lace on the front panels. 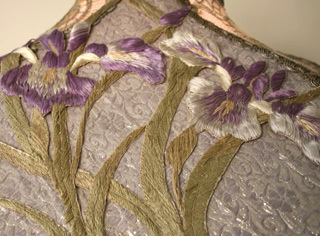 Vintage embossed lavender velvet on the side panels give a luxurious feel to the shade. Wonderful 1920s tole base with original paint holds a Katie style shade with antique fabrics and appliques that have Baroque and Nouveau styling. 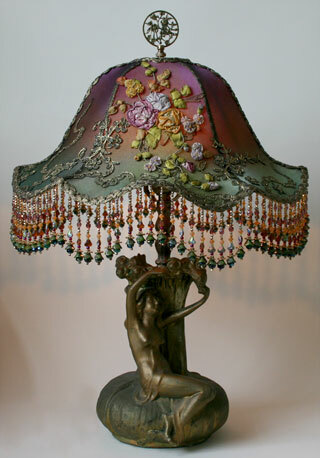 Colorful 1920s lame and great art nouveau metallic appliques with jewlels adorn the top. 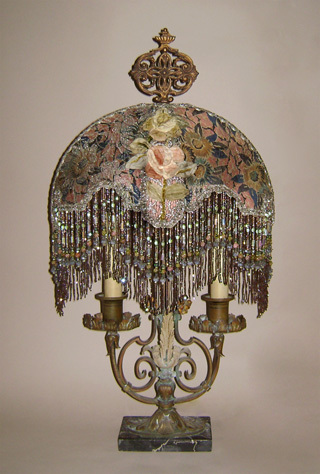 Shade is in tones of gold, midnight blue with accents of peachy coral. 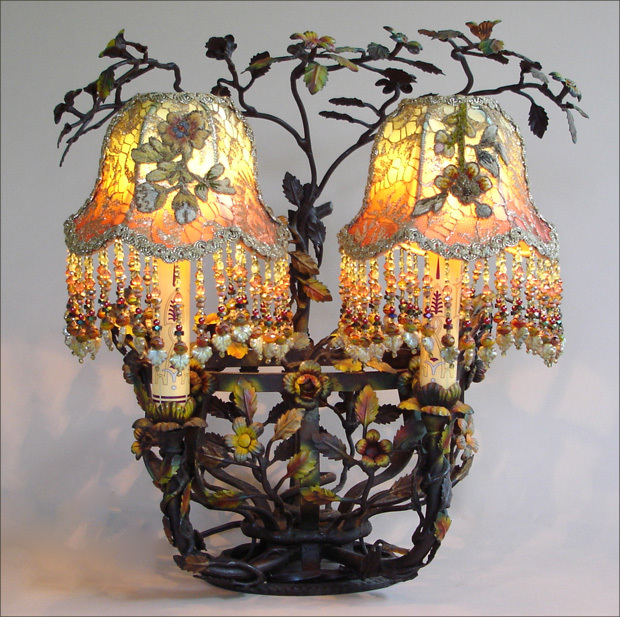 This lights up beautifully with a warm firelight colored glow. 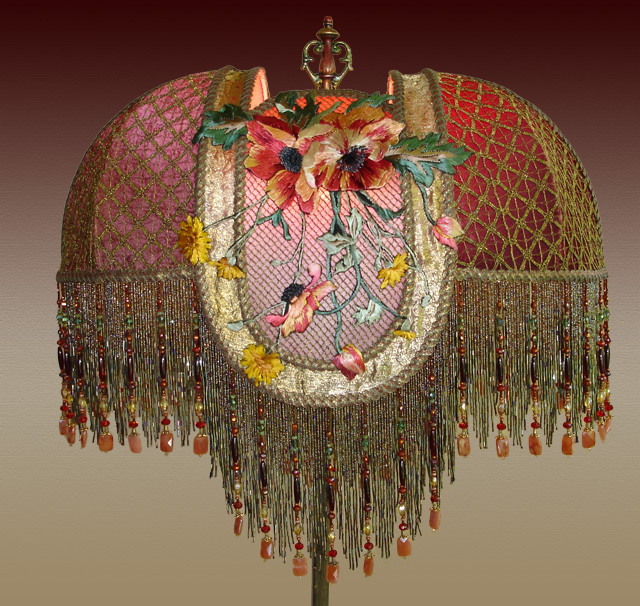 Hand beaded fringe with European snd Swarovski crystal beads. 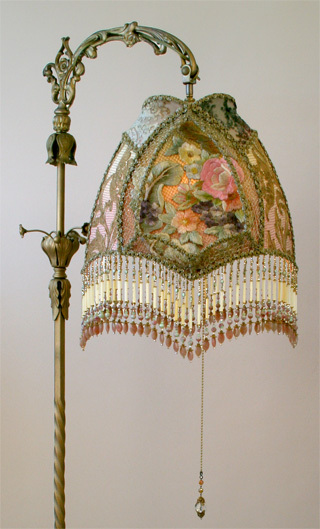 Teardrop Shadowbox shade filled with exceptional Victorian embroidered flowers in delectable pastel colors. 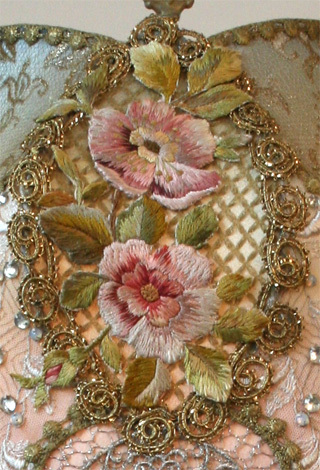 Other panels are covered in vintage silk cut velvet, metallic lace and antique gold net from France. 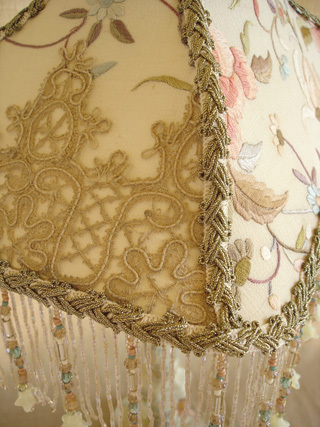 Hand beaded fringe in pastel tones include rare vintage bugle beads. 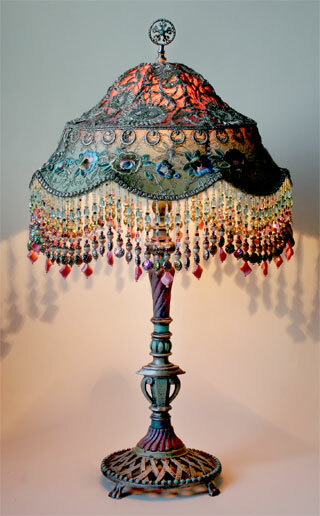 Lights up beautifully. 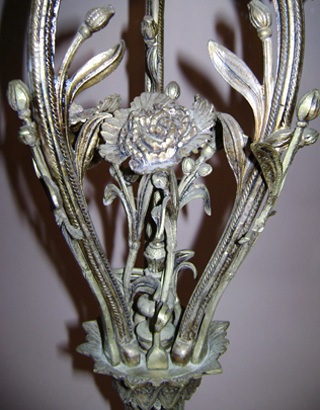 Heavy antique lamp base circa 1920 has painted lilies in the base. 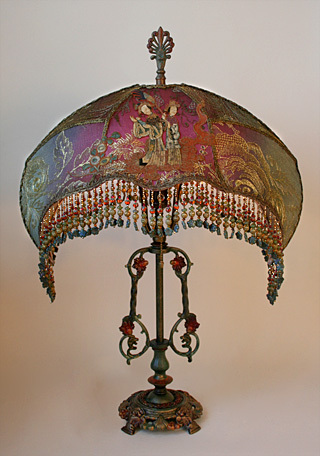 Shade is Minuret style dyed pink and blue than gilded with a layer of antique gold metallic lace with a large colorful Chinese embroidered applique of a lily wrapped around it. 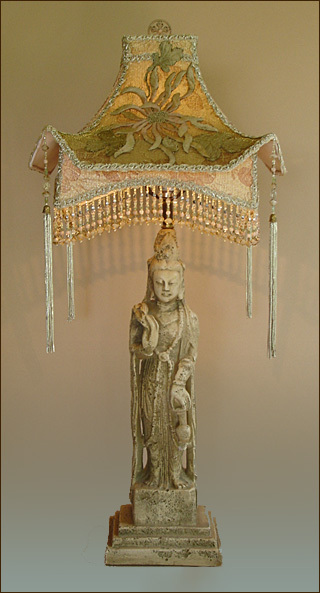 Serene, tone on tone Quan Yin statue lamp with a lantern style shade. 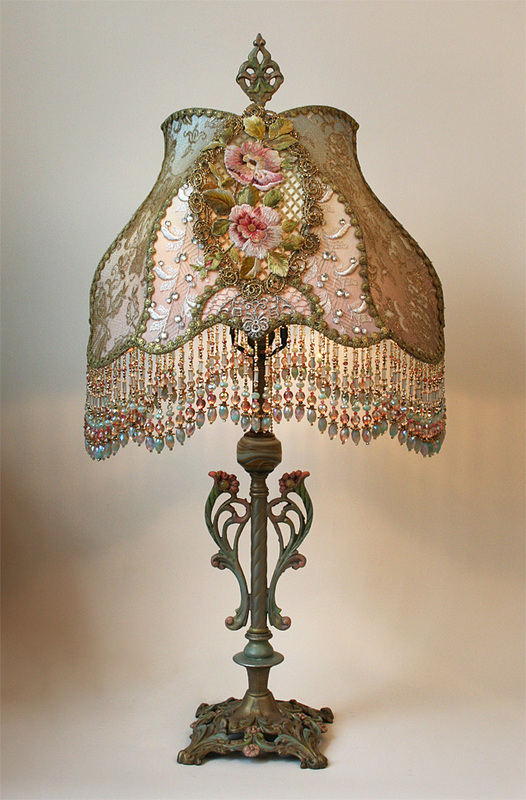 Shade is covered in metallic lame, gold mesh and an antique embroidered organic floral applique. 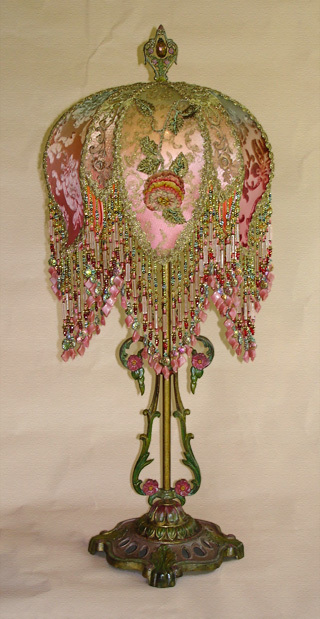 Hand beaded fringe and tassels made with beads and antique 1920s bullion metallic fringe. 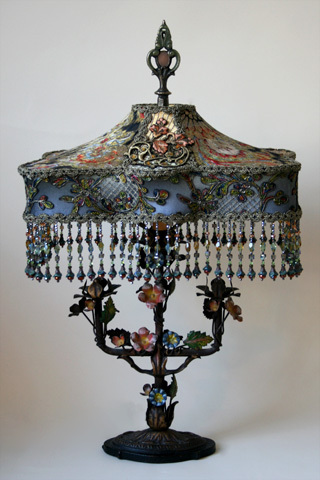 Wonderful antique Chinese chalkware base by artist E. Hunt is adorned with a exotic Napoleon lampshade with antique Chinese embroidery and vintage dogwood silk flowers.